The Yankees’ offense pounded Orioles’ pitching for ten runs on Friday, and the excess of runs was the key to the win as David Robertson, Jonathan Loaisiga, and A.J. Cole combined to allow six runs in relief. Despite the near collapse, the Yankees sealed the deal in the ninth as Betances picked up his fourth save of the season in the 10-8 victory. The offense saw contributions from a variety of players as seven different players drove in runs. Gregorius gave the Yankees their first two runs in the first frame on a no-doubt homer, his 27th of 2018. Torres tacked on the Yankees’ third run with an RBI single in the fourth. In the same inning, Romine drove in a run with an RBI-groundout, and Hicks blasted a home run of his own, his 25th of the season, to give the Yankees six runs with CC Sabathia cruising. Sabathia ran into some trouble in the fifth as Adam Jones found outfield grass on a line drive, plating two runs. However, Sabathia evaded further trouble, finishing his night with six innings of two-run ball. The bullpen was not as fortunate as Sabathia as they were torched as a unit tonight. Boone opted to go with Loaisiga in the seventh, who was only able to record one out. Britton relieved him and was able to keep it a two-run game. The offense was able to earn the runs back, and more, as Luke Voit singled in a pair, and Andrew McCutchen singled in a run. After Stephen Tarpley recorded the first out of the eighth, AJ Cole was brought in with a five-run lead and continued his recent stretch of atrocity, allowing three earned runs and a home run. After relieving Cole, David Robertson allowed one of his baserunners to score on a home run off the bat of DJ Stewart. This brought the Orioles to within one run of the Bombers. 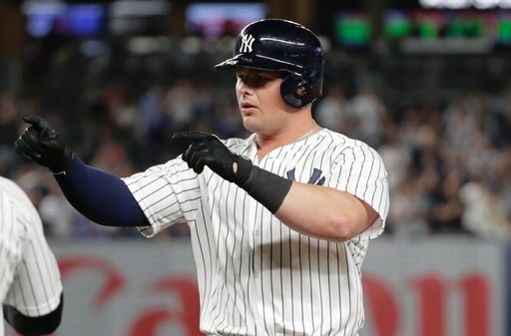 The Yankees got a much-needed insurance run in the ninth as Judge doubled in a run, and Betances was able to shut the door in the bottom half of the inning. Oakland is winning 3-0 as of the publishing of this recap, so the Yankees hold a two-game lead for the first Wild Card spot, for now. The Yankees will look to keep pace with the A’s and secure a series victory versus Baltimore tomorrow. Lance Lynn will face off against David Hess, who is 3-10 with a 5.22 ERA. First pitch is scheduled for 4:05 PM EST, and the game will be aired on YES.